The criteria described below will permit a request to be reviewed by the college's Graduate Studies Committee. As these awards are for all of the college's programs, beginning on any academic term, requests are considered on specific dates. The committee has established application deadlines for each academic term (see below). Award recommendations are made at the professional discretion of the faculty members of the Graduate Studies Committee. Factors that could influence recommendation considerations include, but are not limited to: grade point average, previous awards made to various departmental programs, diversity/under represented needs in a departmental major, strength of requested recommendation and available funding at the time of the review. The Graduate Studies Committee has established a minimum 3.0 undergrad GPA to be considered for any college graduate level scholarship. The undergraduate GPA is determined by the Graduate School as a part of the admissions process and must be at or above a 3.0 at the time of the scholarship application deadline. If the applicant has already completed a graduate program, or was once in a graduate program, that Graduate level GPA should be a 3.0 or greater (and the undergraduate GPA is not considered). Students who are from under represented groups and are interested in the college's programs are encouraged to apply. 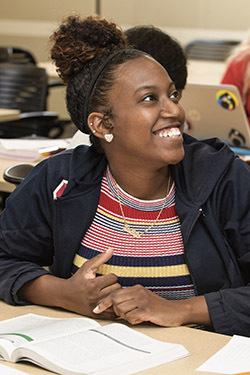 The demographics of the professions represented by the college's programs indicate a critical need for minorities, especially African Americans. Women are under represented in Educational Leadership roles, the mathematics and sciences teaching fields, and in the area of Sport Management. Men are under represented in Early Childhood, and Human Services (Counseling) fields. The demand for Rehabilitation Counselors exceeds supply and therefore, we encourage applicants to our Rehabilitation Counseling programs. In general, the teaching professions also have a high need for teachers in Mathematics, Science, World Languages and Special Education (Intervention Specialists). People with physical challenges are under represented in all of the college’s programs. In addition to the under represented groups described above, candidates can be considered solely on the basis of academic excellence. Candidates who wish to cite the area of academic excellence in their letter of application must have a 3.5 or higher undergraduate or graduate GPA as determined by the Graduate School, at the time of the application deadline. Candidates that are under represented as defined above and meet the academic strength criteria of a 3.5 or better GPA will be considered “top tier” candidates and can be considered for full or partial awards, depending on funding availability. Partial awards will be considered for candidates who are not defined as “top tier”. Certificate candidates are limited to partial awards and cannot exceed $2000 for a student taking 6 or more credit hours per semester, and $1000 for a student taking 3 credit hours per term. The primary criteria for consideration of a Graduate Tuition Scholarship will be based on the student’s overall academic record, their potential for academic success in targeted programs, and the diversity characteristics cited above. At the time the faculty review of applications, the candidate must have a completed application to the Graduate School for a degree-seeking status, or as a certificate student - non degree applicants, licensure/endorsement applicants, or conditionally accepted students will not be considered. Provisionally accepted students can be considered for an award, but an award will not be made until such time as the provision(s) have been met and the candidate is fully admitted as a degree seeking student. Human Services (Counseling) candidates awaiting an admission interview or the results of an admission interview will be eligible for consideration. An award will not be granted until the candidate has been fully admitted. Native Wright State students, who are waiting for the posting of their WSU undergraduate degree, and are provisionally accepted to the Graduate School will be eligible for consideration. The intent of the program is to recruit new students; currently enrolled graduate students will not be considered. "Top tier" candidates (as defined above) normally receive fee waivers at the Ohio Resident Fee rate to support full time tuition, defined by the University. "Top tier" candidates do not have to attend full-time to receive consideration of full funding of tuition. Tuition waivers may be reduced or eliminated based on availability of funding. All other candidates will be considered for partial awards. The amount of the partial award will vary and will be established for each candidate by the faculty members of the Graduate Studies Committee. Tuition waivers may be reduced or eliminated based on availability of funding. Summer tuition awards for all candidates are for all of the summer session terms. If you choose to use your entire award in an early summer session, there will be no funding available for a later summer session. Tuition waivers may be reduced or eliminated based on availability of funding. Students can be eligible for support for up to two years (up to six semesters, which include summer terms), pending availability of funds. One year, 3 semester awards may also be awarded to selected students. Students must maintain a minimum 3.0 grade point average, remain in a degree seeking status, and be enrolled each academic term (summers are optional, but count in the total of maximum terms) for support to continue to a subsequent semester. All Scholarship awards are formally reviewed for renewal for the following fiscal year. No additional information is required from the student for this review process. (This is the "application.") Applicants must submit the following: a letter requesting the Graduate Tuition Scholarship and describing the applicant’s declared program of study, career plans, and diversity information (see target groups in Criteria). The letter must also provide your name, address, telephone number, and email address. Wright State email address and the university’s assigned student number (used to track enrollment) are required if the applicant has applied to the university for admission. In addition to the letter requesting a Graduate Tuition Scholarship, we require one (no more than one, please) letter of support from any one of the following – WSU faculty, K-12 school faculty or administrator, counselor or member of a human service agency, WSU College of Education and Human Services department chair, the College’s Dean or any other university faculty, Chair or Dean from another institution. Attach only one letter of support to your letter of request. Send them both together, not separately. Letters of requests that do not contain the information noted above will not be considered. The Assistant Dean for Student Affairs must receive the letter of request and the letter of support prior to the established deadlines. In fairness to all the candidates, requests for consideration of late requests will not be approved. Fall (August) semester your request letter, letter of support, and acceptance to the Graduate School must be completed by the first business day of March. Spring (January) semester your request letter, letter of support, and acceptance to the Graduate School must be completed by the first business day of November. Summer (May) semester your request letter, letter of support, and acceptance to the Graduate School must be completed by the first business day of March.